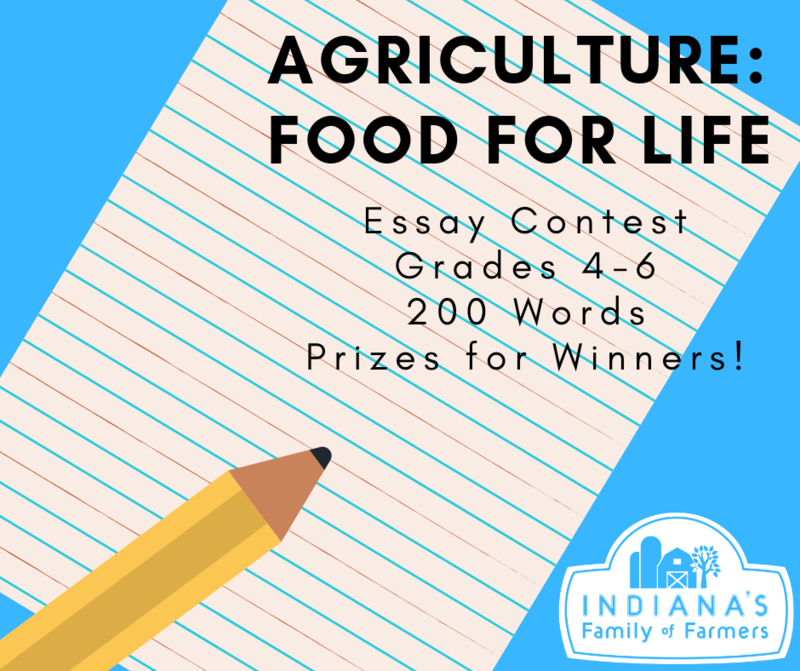 In celebration of National Ag Day, students in grades 4-6 are encouraged to participate in an essay contest, sponsored by Indiana’s Family of Farmers. The essay, themed Agriculture: Food for Life, challenges students to think critically about the important role agriculture plays in their lives and the lives of those around them. The contest is open to students in 4th – 6th grades. Contestants must be Indiana residents. Essay length – up to 200 words. Contestants must compose an original written essay with limited guidance from adults, teachers or agriculture industry professionals. Each contestant may submit only one essay. Each entry must begin with a title page containing: “Agriculture: Food for Life” Then, it must state the writer’s name, grade level, address and city, state and zip code, phone number, date of birth, number of words, and school name. Do not put the writer’s name on other pages. Essays must be typed in 12-point font, double-spaced. Indiana’s Family of Farmers has the right to publish or otherwise duplicate any essay entered in the contest, along with the author’s name, without payment to the author. The decision of the contest is final and no appeals will be recognized. Failure to adhere to the rules result in disqualification at the discretion of the sponsor. All entries must be submitted via email to indianasfamilyoffarmers@gmail.com in Word or PDF format by February 28, 2019.